I’m back in Cincinnati. 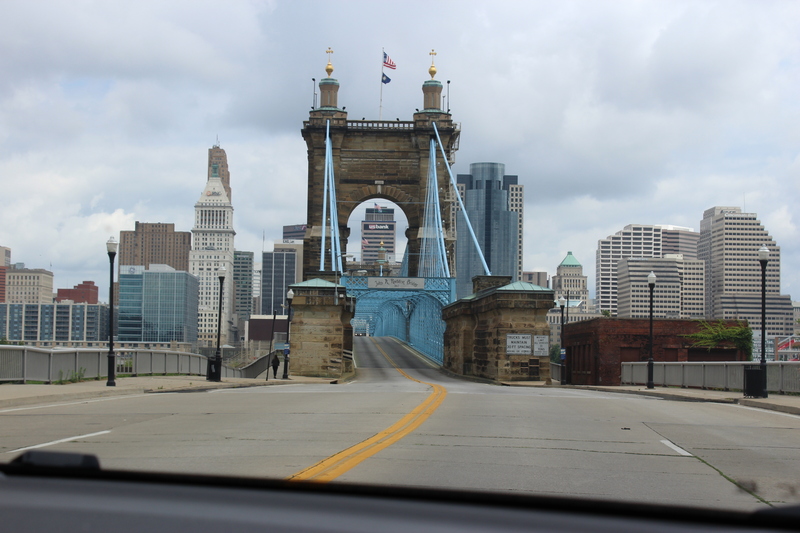 My husband and I headed back to our hometown to visit with family, catch up with friends, and let me take some pictures around the city. We’ve been in town only a few days and we’ve hit a few snags, but we managed to get out on Tuesday to take some pictures. Let me share some of my favorite sights that might have appeared in the Unbreakable Bonds series or could eventually appear. 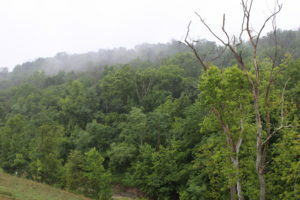 This woodsy pic is actually the view from my parents’ house. 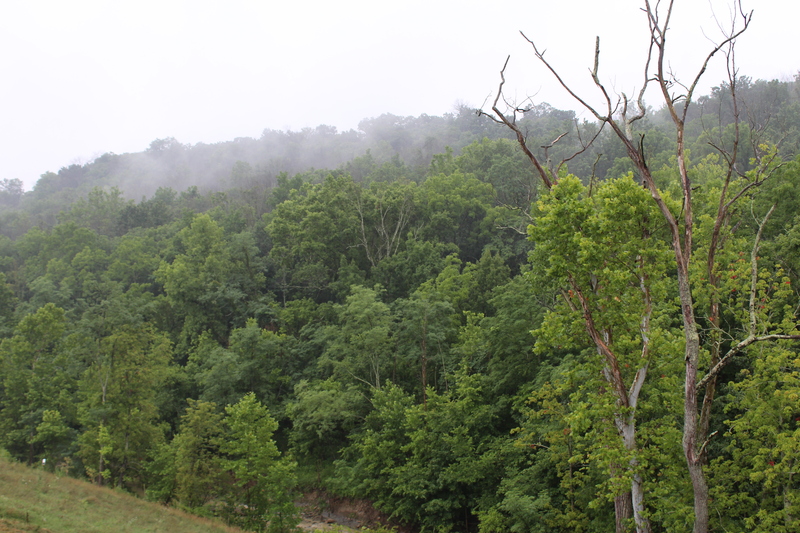 With Lucas and the boys all living around the downtown area, it’s easy to forget that Cincinnati and Northern Kentucky are actually sitting at the foothills of the Appalachian Mountains. In most places around the city, you’re either in a valley or on top of a hill. There is very little flat ground in the area. Seeing the hills and the thick carpet of trees on the hills all around us is something that my husband and I have greatly missed since moving out of the region. Guess whose place that is! 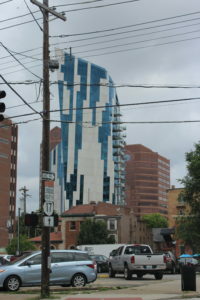 Yep, we were cutting through Covington, Kentucky, on our way to downtown Cincinnati and we passed by the Ascent – which has Lucas’s penthouse. It’s not an overly pretty pic but I’m hoping to make a stop down in the area before I leave so I can get a better picture. However, if you recall a scene relatively early in Shatter where Snow is walking around Covington, looking for Gratton, he ends up stopping on the sidewalk and looking up to see the Ascent, thinking of Lucas… and Andrei. This would have been his view when he stopped on his walk. Of course, getting from the Northern Kentucky to Cincinnati, Ohio means crossing the Ohio River and we used the Suspension Bridge to get there. It’s the bridge that is most frequently mentioned when the boys look out the window from Lucas’s penthouse, though you can see other bridges from his place. This view of the bridge also gives you a little bit of the skyline for the city. For the locals, this bridge is also called the Singing Bridge or the Humming Bridge because of the sound that is made when the car tires run over the grates that make up the flooring of the bridge. When I was a kid, sometimes we would park in Covington and walk across this bridge when we went to Cincinnati Reds play at the stadium. 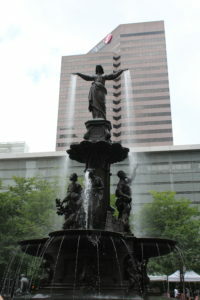 Fountain Square is sort of the heart of the city. It’s the gathering place. It’s one of many parks withing the city. 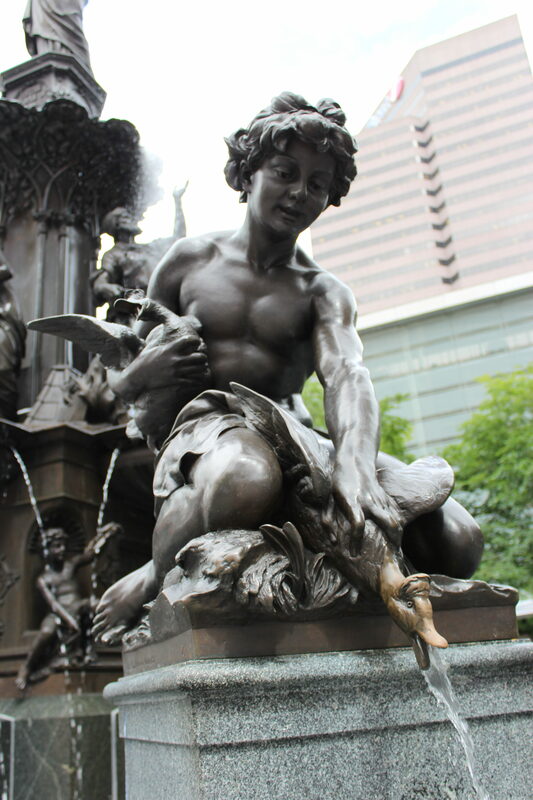 This is the fountain that is on the cover for Unbreakable Stories: Lucas short story collection. During the summer, the square has various booths set up on Tuesdays as a sort of mini- farmers’ market. There’s frequently a stage set up for free concerts. In the winter, they place a giant Christmas tree and menorah as well as a ice skating rink. Under Fountain Square, there is a parking garage, allowing you to park at a central location so you can easily walk to the various events, shows, restaurants, and bars. I’ll admit this where I usually start when I head downtown. 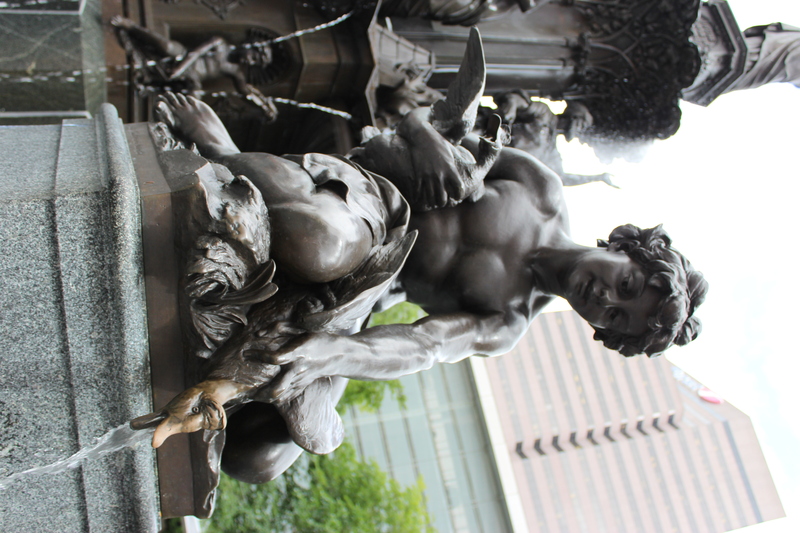 From Fountain Square, you can walk over to the Aronoff Theater to catch a Broadway show or hit the Contemporary Arts Center. 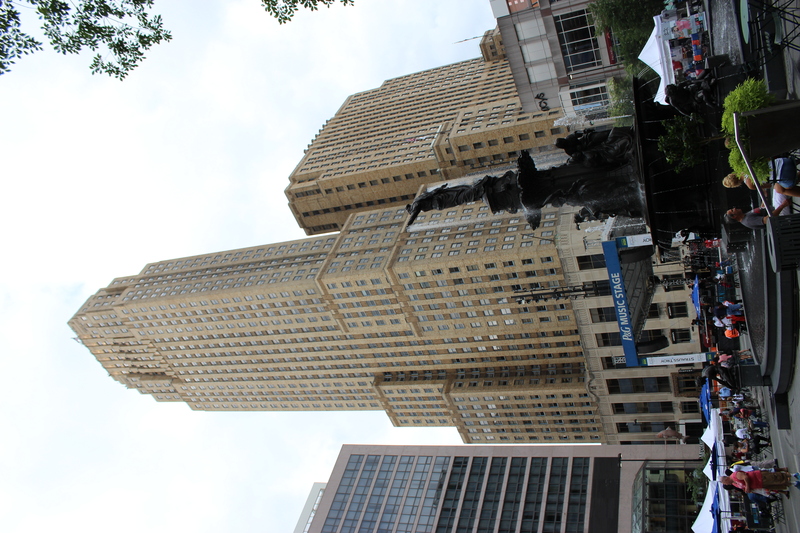 Also, from Fountain Square, you are less than a block away from where we placed Ian’s restaurant, Rialto. We haven’t placed any scenes on the Square just yet, but maybe we can sneak a scene in an upcoming book or story. I wanted to include one last picture of the fountain. This is a close up of one of the smaller statues lower on the fountain. I know that I’ve visited this fountain a few dozen times over the years, but there’s always a new detail to notice with each visit. That and it really is a beautiful fountain and square. Since I’m throwing in some fun pictures, I thought I would include this one. We found him when we were walked back toward Fountain Square and passed the Cincinnati Shakespeare Company. 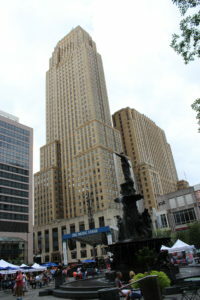 If you’re not familiar with Cincinnati, she is also known as the Queen City, Porkopolis, and the City of Flying Pigs. Many years ago, the city commissioned dozens of artists to decorate pigs, which would then be auctioned off. It’s been years and years since the auction, but you can still spot the occasional pig while wandering around the city. 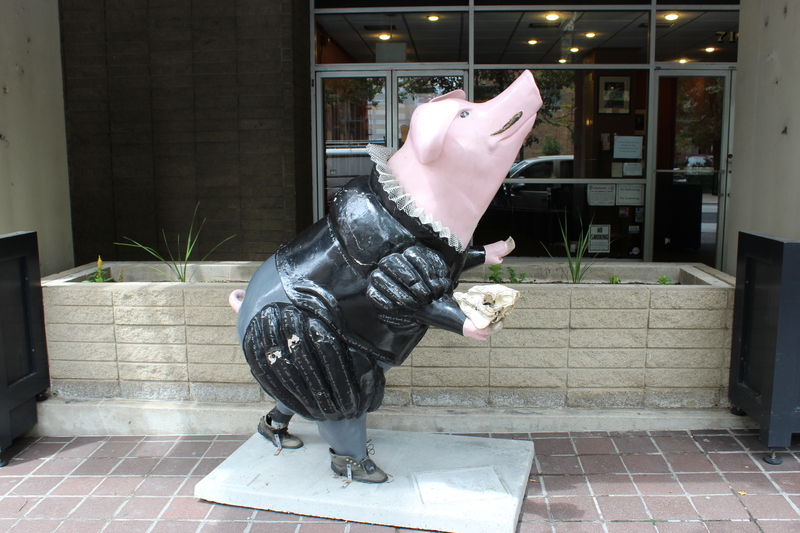 With the pig skull balanced on his hoof, I’d wager that this pig is named Hamlet. Hopping back across the river to Covington, Kentucky, there’s a tiny little area called MainStrasse. My husband and I have spent a lot of time bar hopping in this area. It’s a very popular spot among the locals – college students and older. Lots of bars, tattoo parlors, unique little shops, and restaurants. If you remember the bar scene at the beginning of Shatter, this is the part of town the boys were hanging out in. In fact, Snow runs right past the Goose Girl fountain. 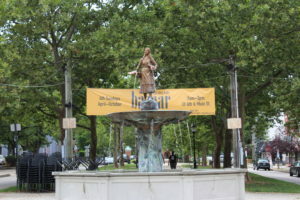 Why is there a Goose Girl fountain in MainStrasse? I’ll admit that I have no idea. I’m sure there’s a plaque on the fountain explaining why there’s a bronze girl holding geese, but I just haven’t read it. I usually just give her a nod as I head to my destination. 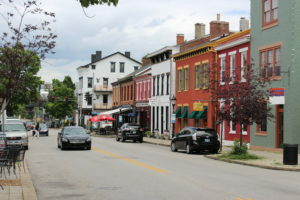 This picture is just a shot down Main Street of the Village (aka MainStrasse) so you can get a feel for the quaintness of the buildings. After the sun sets, this place is packed, particularly on Friday and Saturday. 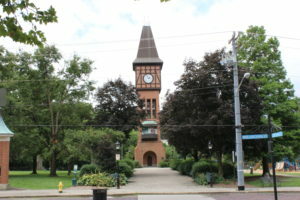 And finally, here’s a picture of the clock tower in Mainstrasse. We were lucky enough to be there right as it turned 2pm. The bells chimed and then the most magical thing happened. 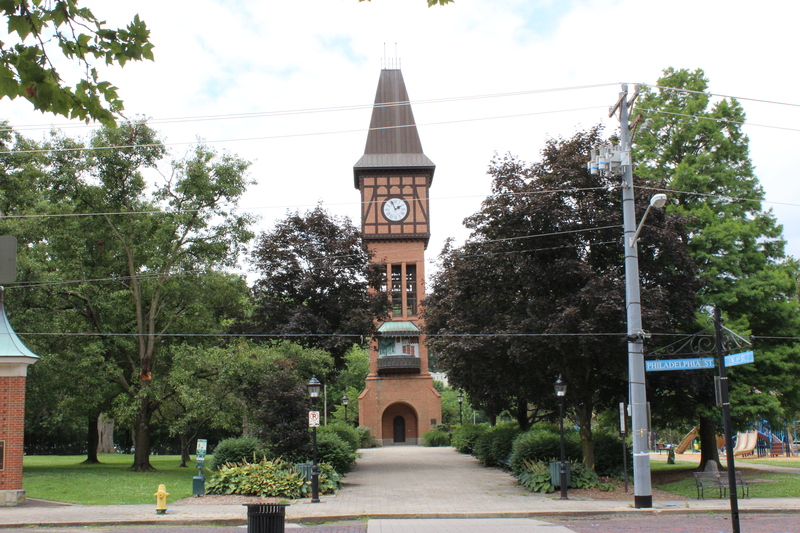 During the summer, the clock tower tells the story of the Piped Piper with little moving figures and a voice over. It was just the coolest thing. If you’re a member of our Facebook Group, Unbreakable Readers, you can watch the video I posted of the little show. Thanks for walking around the city with me. I hope you enjoyed the pictures and tour through the city the Unbreakable Boys call home. If we can sneak out between rain storms, we are hoping to get some more pictures. I would like to get some pictures of the area for the car chase from Shiver and show Rinda some pics of Krohn Conservatory — a place that definitely needs to be in a book. Very nice! Like that it’s not just being all high rise buildings. Love the old buildings on Main Street of the Village. Thanks so much! 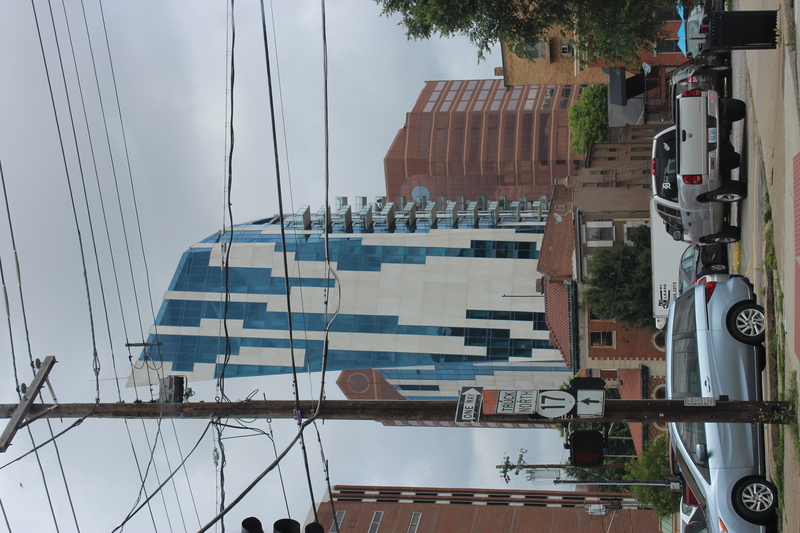 Cincinnati has a great mix of new and old. She’s got some great character to her.